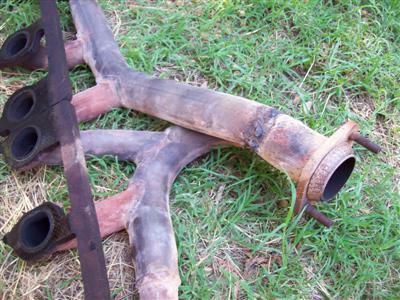 Broken Jeep Exhaust: Weld or Replace? 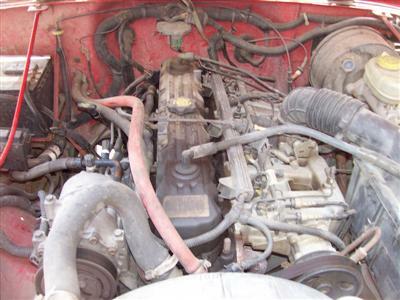 The factory Jeep exhaust manifold/header on many 4.0L six-cylinder and 2.5L four-cylinder engines is woefully weak and often succumbs to cracks and leaks. When this happens your Jeep will often not pass state emissions inspections, be noisy and also emit some noxious fumes into the cabin area where you and your passengers sit. Some Jeep owners opt to weld the offending crack to seal it off...which in many cases works at least for a while. However, the best way to correct a cracked leaky header is to replace it with a new aftermarket piece. Now, there are many quality replacement Jeep exhaust manifolds including high performance headers from companies like "Gibson" which can run into the $400 to $500 range. 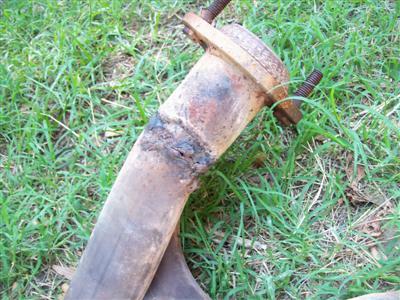 However, most standard replacement headers cost between $150 and $250 for the part only. When I bought my '95 Wrangler YJ 4.0L the header was already cracked and at one time the previous owner had it welded. As you can see in the photos above the weld had split open and once again the header was leaking exhaust gases. The "Check Engine" light was on and I suspected it was due to the leaking exhaust header. I opted for the Free Shipping, because I was in no hurry and was happy to receive the new parts within 7 to 10 days as promised. Other faster shipping options are available for various fees. When the new header, gasket, collector donut and mounting bolts (all included) arrived I was able to install everything with no problems due to a perfect fit. Note: If you order anything online for your Jeep make sure it is designed to fit your specific model application. The following week my freshly muffled YJ (added new muffler and catalytic converter as well) passed inspection with flying colors...or at least without any glitches! I had done all of the work myself and saved a boat-load of money in the process. And saving money makes me real happy! Doing a Search of My Website is the Easiest Way to Find What You May Be Looking For! Hi, this is Larry..the author of this website. I know you hear a lot about how to build an online business...but nothing compares to what you will see when you click the box below. Proven simply the best!